The Fifth Voice is about the power of music and friendship, and the incredible influence both can have on our lives. The four main characters are struggling in various ways with what life has thrown at them (an illness, a betrayal, a bereavement, a mid-life crisis), but when they sing together none of that matters. Together they embark on a journey of self-discovery and self-healing, as they go in search of the mysterious and elusive Fifth Voice. My very first memory is hearing Help! by The Beatles playing in an amusement arcade when I was just five. Listening to the song as an adult, I remember what it was like to feel happy and carefree as a child on holiday, being transported by music for the very first time. Coincidentally, John Lennon said he wrote the song at a time when he’d completely lost himself and was harking back to when he was much younger and everything in life was much simpler. Aside from the obvious connection (four singers), The Beatles inspired The Fifth Voice by providing two of the protagonists, Vince and Danny, with the material for their opening dialogue, arguing about their favourite albums around a pub table. They don’t see eye-to-eye when it comes to The Beatles, Vince referring to the Sergeant Pepper album as ‘a pile of over-contrived, trippy nonsense’. Danny hits back by informing his friend that ‘when Sergeant Pepper was released, Kenneth Tynan in The Times said it was a decisive moment in the history of Western civilization’. And so the tone is set for the emerging friendship between the two. One of my own favourite albums is Astral Weeks by Van Morrison, which features the song Ballerina. It’s a haunting evocation of a love unrequited, or perhaps broken in some way. Listening to it, I get a sense of fragility, of a man who is yearning for this perfect vision of a woman to be his. The fact that I was once married to a ballet dancer means that those feelings have the ring of truth, and both the song and my personal experience compelled me to include a character in the book who was once a ballet dancer. Margaret, the mother of Neil (another of the quartet) is a smart, sensitive, worldly and compassionate lady of a certain age. She has suffered the loss of her eldest son, which both she and Neil are struggling to come to terms with. She has every right to be bitter, but instead she throws all her energies into looking after her husband and remaining son, helping local charities, and running a ballet class for the senior citizens of her village. In her early years she lived a rarefied and exotic life as a dancer in Paris and was, without doubt, held in as much esteem as the ballerina in Van Morrison’s achingly beautiful song. One of the first songs I learned to sing in four-part harmony was a Beach Boys medley featuring the ballad In My Room. It made a big impression on me, as the harmonies are delicate and easy, and yet powerfully moving. I had to make it the first song the quartet in The Fifth Voice sing together, the one that makes them and their assembled company realise that their voices blend beautifully and that they could have a future as a quartet. Well, that certainly explains things. From the way you sang just now, I’d guess that the room is painted entirely white. Featureless. And I’d say that the bloke in question is probably wearing a straitjacket, that the walls are padded, and that the door is heavily bolted from the outside. The book is about the search for harmony, not just in the musical sense. Ken inspires the quartet to discover a curious vocal technique called The Fifth Voice, which has the promise to deliver a prize much greater than anything they can imagine. This idea was inspired in part by listening to harmonies on a grand scale, in the form of Spem In Alium, a 40-part Renaissance motet by Thomas Tallis. Composed in the 16th century for eight choirs of five voices each, this majestic piece is mind-blowing in its complexity and beauty, and no wonder it is widely considered to be the greatest piece of English early music. Listen to a top quartet ringing chords, and the room will fill with harmonic overtones. And at a purely physical level, you could say that those harmonic overtones are themselves an independent voice. A fifth voice, so to speak. But that’s only part of the story. Any competent quartet can create a fifth voice, but very few find The Fifth Voice. That’s something that goes beyond the physical. Something that comes from inside each of you. Something you have to search for. Paul Connolly was born and brought up in Liverpool. After studying biology at Manchester University he worked for many years as a technical author in the computer industry, the foundation of his writing career. 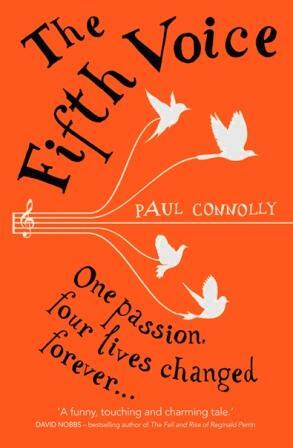 Paul sings bass with award-winning a cappella group The Royal Harmonics, which provided the inspiration for his debut novel, The Fifth Voice. He lives in Berkshire, visits Lundy Island as often as possible, supports Everton FC, and has a grown-up daughter. 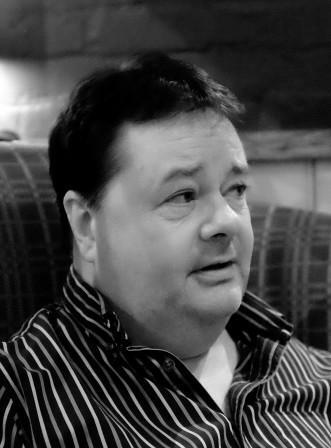 He is currently working on the sequel to The Fifth Voice, and you can connect with him at www.paulconnollyauthor.com and on Twitter @ACappellaPaul. The Fifth Voice is available as a paperback and ebook. This entry was posted on August 27, 2014, 5:37 am and is filed under Undercover Soundtrack. You can follow any responses to this entry through RSS 2.0. You can leave a response, or trackback from your own site. In My Room and Astral Weeks have both heavily influenced my writing as well. Really enjoyed this interview! Really good books about male friendship are rare and this one is a gem. Great holiday reading! Thank you, Ruth! Glad you found your way here to Paul’s post!